WorldofVolley :: CL M: Clash of titans in Perugia - Ngapeth is the hero of episode 1! The reigning champions win the game in the tie-break against Perugia to earn an advantage after the first game of the CEV Champions League semifinals. Zenit Kazan opened the game in a much better way, controlling the situation on the court and winning the first set. In the second set, it's interesting that the Russian team had a set point, but after some good serve and defensive moves, Perugia made a 3-0 scoring run to tie the game. 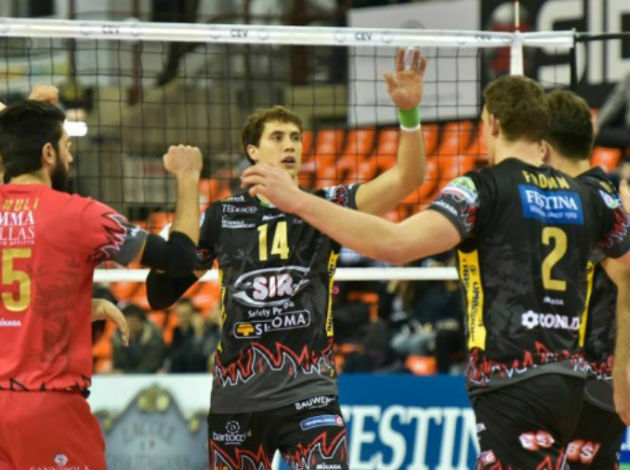 Alekno's side was again much better rival until the middle of the third set when Perugia managed to reduce the advantage of the rival and even to tie the score. However, Zenit Kazan somehow outplayed the rival and took the 2-1 lead. In front of fully packed arena Pala Barton in Perugia, the home team didn't want to let the rival win the game in four sets so they won the fourth set and pushed the game to the tie-break. After a great battle in the fifth set, Zenit Kazan have come out as the winners to earn a big advantage before the hame in Kazan. Earvin Ngapeth shined in this game with 22 points, while Matt Anderson had 20. In the home team, Wilfredo Leon scored 25 points, while Aleksandar Atanasijevic ended the game with 24 points. 2 Comments about "CL M: Clash of titans in Perugia - Ngapeth is the hero of episode 1!" In your face all those who said Ngapeth can't dominate big games. In your face. The man is a BIG TIME PLAYER. He was monstrous from the very first ball. Vicious from serve and attack with match changing defense plays... Let's watch part 2! Bravo Ngapeth! He was really solid yesterday.